In the Grand Duchy of Lithuania, the 16th century was considered as one of the most bloody ones. Many times, enemy detachments tried to conquer Belarusian lands. Therefore, the inhabitants of these lands erected majestic defense installations. However, in the principality, as in all of Europe at that time, stone castles were the privilege of the main, most important cities, but other settlements also needed protection. That is why the defense power was transferred to town halls, usual houses, manors, churches, monasteries. Among such buildings on the Belarusian is the famous Polotsk Sophia Cathedral, which in the 15-16th centuries was converted into a fort church with 5 towers, Synkovichi fort church, Calvinsky Cathedral in the Ostashino village, the house of a feudal lord in the Haytsiunishki village of Voronovsky region. The same character is the Malomozheikovskaya fort church of the Nativity of the Virgin (Murovanka). Interesting fact: there is an opinion that Muslim minarets are an example in the construction of Synkovichi and Murovanka Churches. This is confirmed by an unusual form of buildings and the presence of tall, slender towers. 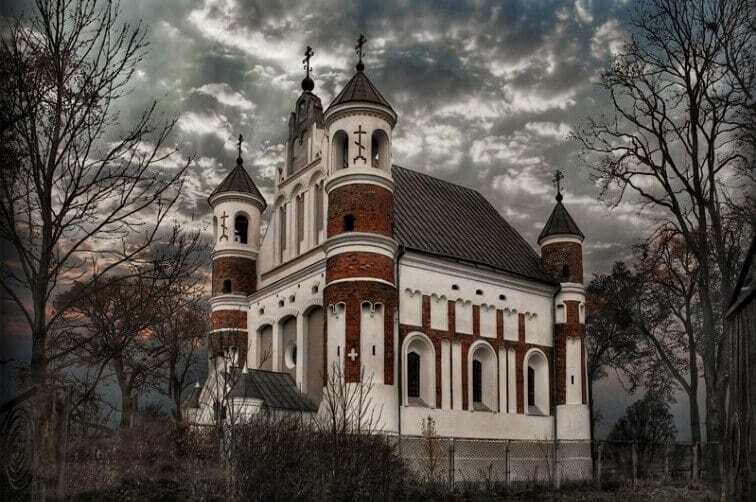 Near the town of Slonim you can see one of the most amazing buildings in Belarus - the Synkovichi Church. It is high, it seems to reach up to the clouds and is visible from afar. The walls of red ancient brick look like scorched by the flames of numerous wars, it is difficult to look away from this unusual monument of architecture. Synkovichi Monastery is a fort church with the silent loopholes in the walls of the temple. Behind its walls, people not only prayed but, if necessary, defended from the enemies, defeating them. The Synkovichi church, according to historians, was built in the early 15th century. 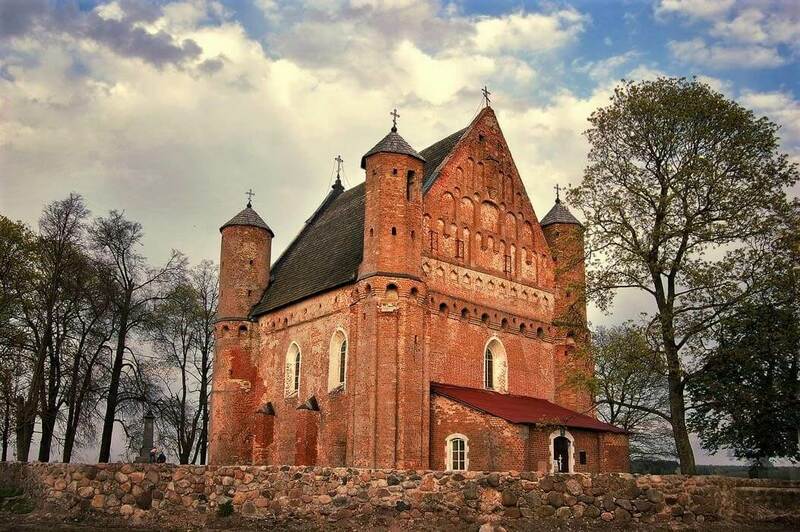 The legend says that the Grand Duke Vytautas himself laid it: he ordered to build a church in the village near Slonim, as a token of gratitude to the God and the local people who helped to hide him, thereby saving their lives. Unknown talented masters fulfilled the will of Vitovt, erected a beautiful fort church. Interesting fact: under the floor of the Synkovichi Church there used to be a crypt, and in the courtyard there was a tombstone to the wife of the temple attendant and her little child, who died in 1872. During the reign of the Russian Empire, and then the Soviet Union, the temple was used as a warehouse. Today, it is an active Orthodox church, were worship services and ordinances are held regularly. Synkovichi fort church attracts tourists with its restrained severity and fabulous beauty. High walls, 1.5 meters thick, and in the corners of the church tower round towers with loopholes and observation platforms. Some fragments of the decoration of the temple remind tourists of the Mir Castle elements. An interesting icon of the Synkovichi fort church is the icon of the Mother of God. People believe that with the help of prayers icons can heal from serious illnesses (cancer, alcoholism, drug addiction). Interesting fact: Synkovichi church fortress is famous throughout Belarus for its unusual sounding of bells. Tourists are also impressed by the acoustics of the temple: resonators built in the walls bring the singing of prayers to all corners of the building. Where is the Synkovichi Fort Church situated: Synkovichi Village, Zelvensky District, Grodno Region (15 km to the west from Slonim). How to get there: by bus from Slonim (they don’t ride often) to the center of the Synkovichi village, then 15-20 minutes walk to the northern outskirts of the village. 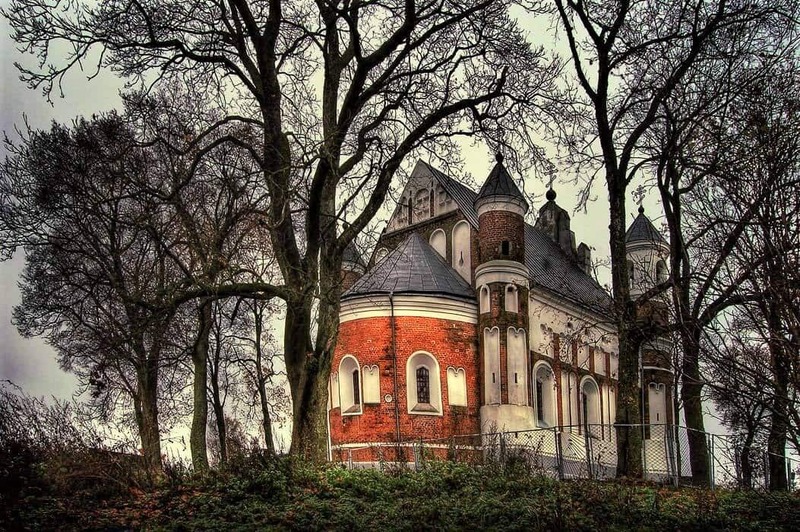 A similar tourist attraction, the famous fortress church of Belarus, is also in the Grodno region, in the village of Murovanka. According to one version, this monument of defensive architecture of the Gothic style was built in 1407. However, according to later studies, it is believed that the church was built only in 1524. The funds for its construction were given by the Vilnius subterranean - Shimko Matskevich-Shklensky. Also, the Murovanka Church received generous donations from the Sapega, Zavisha families and other notable people. In the early 17th century, it was one of the richest in the Belarusian land. According to one of the existing legends, it is said that Shimko also took care of the black day for the church. A note was found in his coffin about the hidden treasures for the needs of the temple. The church guardian, envious Pan Kostrovitsky found out about the note, gold and other treasures that were allegedly hidden in the grave of the founder of the temple. This was a real tragedy for the local priest Peter Afanasevich. Kostrovitsky demanded to return the found wealth, frightened the priest, beat his family, and later ordered to strangle the wife and mother of the priest, scoffed at his brother ... but the treasure was never found. Then angry Pan Kostrovitsky burned down all the documents that concerned the history of Murovanka. After that he forced to dig up the ground in the cellars and around the temple, knock out all the walls, dismantle the roof ... but the gold was never found! In order to take revenge on the church and its ministers, the derelict Pan took all the furniture from the temple: he took off the richly decorated gate and hung it on his barn. He tried hard to discourage people from this church, from the Orthodox faith, but this time defensive and spiritual power withstood! Not without reason, Murovanka was called a fort church. In architecture, it looked like a medieval castle. The walls were laid out of bricks, strong like iron (in the technique of Gothic masonry). In the dungeons, there were rooms for weapons and military purposes, church inventory. In the corners there were 4 majestic round hipped towers, which could only be accessed from the inside of the church, along steep stone staircases. A secret passage and exits in the walls saved defenders from the unexpected invasion of the enemies. The church fortress differed from the usual church with the loopholes. As early as the beginning of the 19th century, the entrance, like in the Mir Castle, was defended by heavy iron doors that fell on powerful chains from above. In the attic there were battle galleries. Unfortunately, time did not regret these defensive medieval features. The towers gave the church its architectural uniqueness. They towered high above the roof, which was covered with tiles and resembled fish scales. Smooth red walls stood out whitewashed niches, decorative ornament. The rose window on the main facade beautifully shining in the sun preserved to our times pleasing our eyes. Throughout its history, Malomozhejkovskaya Church served as a temple, a fortress, more than once saving human lives. Enemies were afraid of it not only because of the holy spirit, but also because it fought off the enemies bravely and desperately. 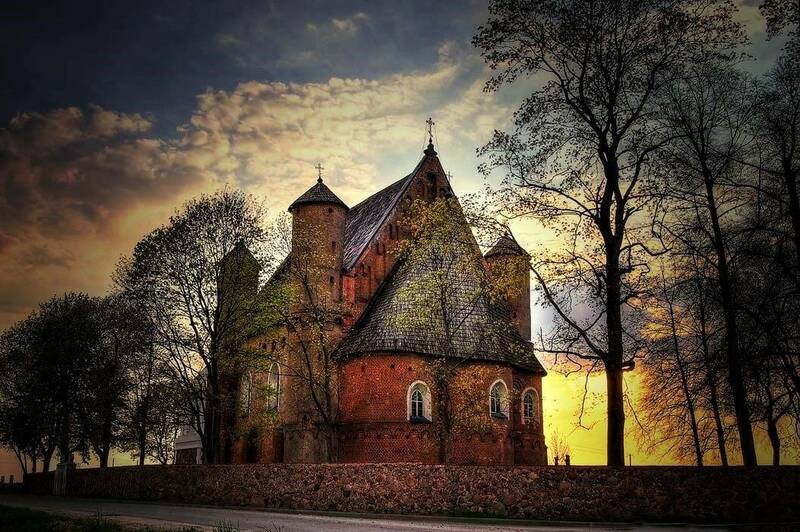 Even the Swedish king, warlike Charles 12, was surprised by the inaccessibility of the Murovanka church. He gave the order to shoot the church from guns, but they spent time in vain, lost their soldiers, and the fort church was never conquered. The heavily ruined temple stood, however the later raids and destruction brought it to a state of distress. At the very beginning of the 19th century, Malomozhejkovskaya church-fortress was seen by the Russian Emperor Alexander the First. Its majestic look, even in ruins, impressed the king. The autocrat gave the order to restore the church immediately, but only on February 21, 1873, after a thorough renovation, the temple was consecrated, Murovanka lost much of its primitive appearance. Interesting fact: despite the general similarity with the Synkovichi Church, Malomozhejkovskaya Church has its own characteristics - a more rich external design, a symmetrical and correct plan, a weak system of loopholes. More than a hundred years ago, in 1906, the last major renovation of the temple was made, since then nothing has changed in the external appearance of the temple. Now on the territory of the church fortress you can stroll, visit the service, book a tour around the temple. Where is Murovanka Fort Church situated: Murovanka village, Shchuchin district, Grodno region. How to get there: on foot from the Skribovtsi railway station (the train goes on the route Grodno-Lida). Visiting is free of charge. 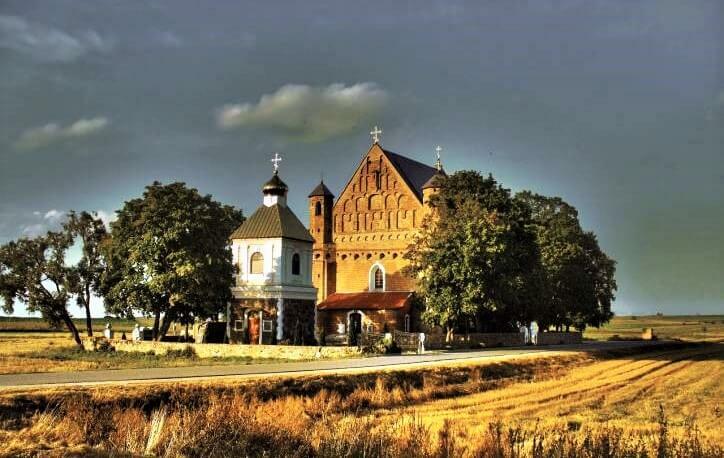 It was our list of fort churches in Belarus, unique and beautiful buildings that you can still see in our country. Plan your next trip!